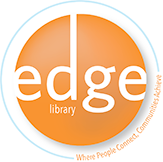 The Robert J. Kleberg Public Library has Public Internet Access Disclaimer Notices regarding the electronic resources and services the Library provices its patrons. Users should be aware that the Internet is not a secure medium and that third parties may be able to obtain information regarding users' activities. However, the Robert J. Kleberg Public Library will not release information on the use of specific Internet resources by members of the public except as required by law or necessary for the proper operation of the Library. 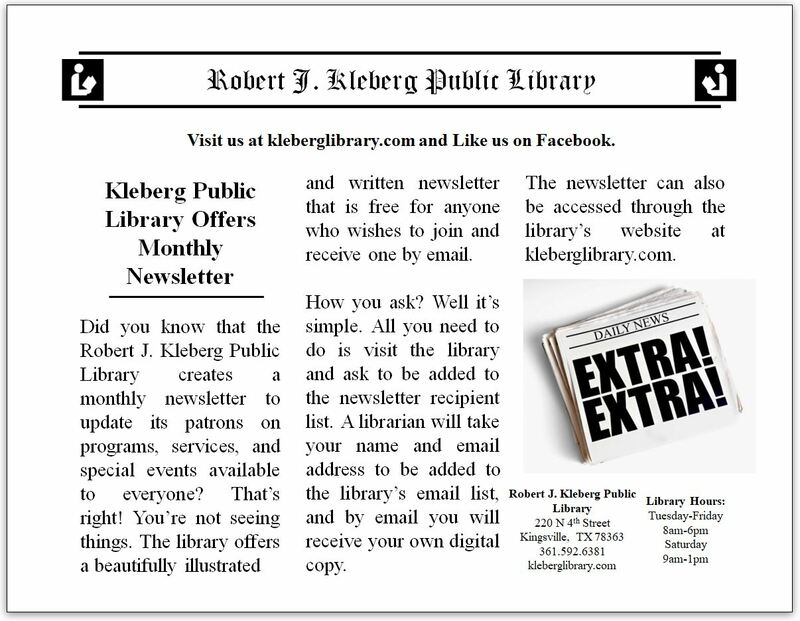 The Robert J. Kleberg Public Library cannot guarantee the validity or accuracy of information found on the Internet. Library patrons are advised, as with all library materials, to exercise judgment and discrimination when evaluating the usefulness and reliability of material found on the Internet. The Robert J. Kleberg Public Library utilizes virus-checking software, but this does NOT guarantee that everything will be completely protected from viruses. Software downloaded from the Internet may contain a virus. The Robert J. Kleberg Public Library is not responsible for any loss or damage to personal disks when downloading, or to a user's own computer. Further, the Library is not responsible for any loss of data, damage, or liability that may occur from a patron's use of the Robert J. Kleberg Public Library's computers. Violations of the Robert J. Kleberg Public Library Policy and Procedures may result in suspension or loss of privileges to use computer resources at the Library. Any illegal activity involving the use of the Library's computers, including the Internet, will be subject to prosecution by the appropriate authorities. In addition, patrons shall agree to hold harmless, indemnify, and unconditionally reimburse the Robert J. Kleberg Public Library for any damage, liability, costs, claims, or expenses that the Robert J. Kleberg Public Library may incur or that arises in any manner from any use or misuse of the Internet access by a patron. With billions of pages on the Internet, finding what one is searching for sometimes feels like looking for a needle in a hay stack. Try the library's "Search the Web" search tools/engines located on our Homepage to help you find what you are looking for. Please try more than one Engine because they all work a little differently and may bring back different results. Many of these sites are incorporating both crawler/search engines and directories to provide better search results. Some are now Portals providing many other services such as free e-mail accounts and personalized pages that display one's personal preferences (stock quotes, sport scores, local weather, etc.). Crawler/search engine sites use special software that "crawls" the Web (often called robots, bot, spider or crawler) looking for content. These sites work best for more specific, narrow topics. The Community Page is a collection of some local organizations and Websites along with phone numbers and addresses for some area Government Offices, Utilities and Telephone Companies, Emergency Services Information, and Other Points of Interest. Any links to external Websites are provided as a courtesy. The findings, interpretations, and conclusions expressed on these sites are entirely those of the author(s). They should not be attributed in any manner as an endorsement by the Robert J. Kleberg Public Library of the content or views of the linked materials. The Library reserves the right to accept or deny any requests for references to links or third party sites. This page is periodically updated. 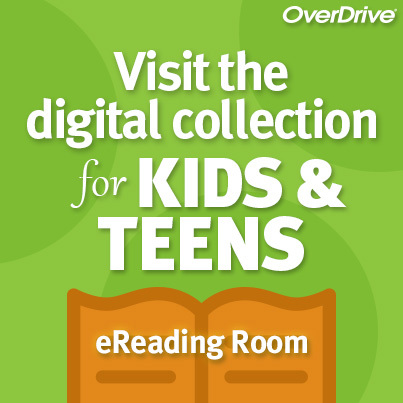 The Robert J. Kleberg Public Library provides the Kids and Teens Page on the library's Website as a couresty to our Online patrons and cannot guarantee the validity or accuracy of these external sites. Library patrons are advised, as with all library materials, to exercise judgement when evaluating the usefulness and reliabity of materials found on the Internet. The Ipl2 database is the main search engine being used and it allows kids and teenagers to access hundreds of online resources for homework, special projects, research and more. The Ready Reference Resources page is a collection of Websites presented as a source for ideas & learning, and are provided as a courtesy. Because the Internet is unregulated, there may be links to subsequent sites on these links. The Library disclaims any responsibility for the content or availability of those sites. The findings, interpretations, and conclusions expressed on these sites are entirely those of the author(s). The content or views of the linked materials should not be attributed in any manner as an endorsement by the R. J. Kleberg Public Library. The Library reserves the right to accept or deny any requests for references to links or third party sites.